55 Gallon, Open Head Steel Salvage Drum, Plain Cover, Plain Body, Yellow, Unlined, UN 1A2/Y1.8/150/X400/S Wt. 49 Lbs. Interior Dimensions: 22.50″ I.D. X 34.50″ I.H. 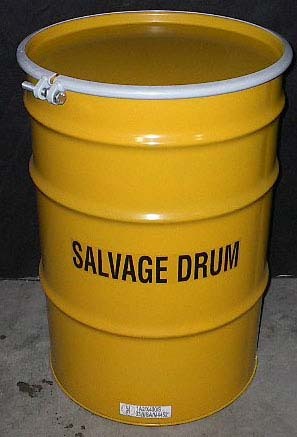 55 Gallon, Open Head Steel Salvage Drum – The next size up from the 30 gallon salvage drum. The 55 Gallon Open Head Steel Drum is arguably the easiest to transfer considering how most petrol and chemical drums are similarly sized. Made with Carbon Steel and fit to the standards of UN 1A2/Y1.8/150/X400/S this is one of the most common products we sell. 22.50″ I.D. X 34.50″ I.H.